In 2017, the total number of M&A deals completed in the Middle East region fell by 12% compared to the previous year; 222 deals closed in 2017 compared to 254 deals in 2016. While the number of deals fell, the aggregated value of the total closed deals was much higher in 2017 compared to 2016. Indeed, in 2017 the value was around $53 billion, an increase of 56%. In Q4, deal activity slowed to 46 deals from 57 in the previous quarter, a 19% drop. This was also reflected in the total aggregated value. Q4 was the weakest quarter in terms of total aggregated value for the year; 64% of the total value was closed in Q1. 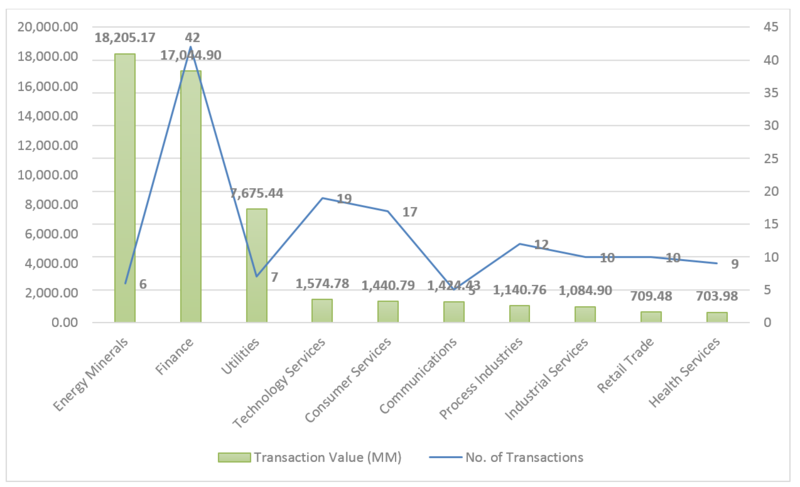 For the year, the Energy sector led all other sectors, accounting for 34% of the total aggregated value, followed by the Finance industry, with 32% of the total value across 42 deals. At the country level, the United Arab Emirates registered the highest aggregated value in 2017 with a total of $14 billion, followed by Russia and the United Kingdom. The top three countries by number of deals were the UAE with 65 deals, Saudi Arabia with 20 deals, and the United Kingdom with 11 deals. Inbound transactions, where both acquirer and Target Company were in the Middle East, represented 35% of the total deals in the region with 77 deals out of 222 for 2017. Most of the deals are concentrated in the most active countries in the region; Saudi Arabia had 15 deals while the UAE had 34 deals. Oman Telecommunications Co acquired an additional 12.1% minority stake in Mobile Telecommunications Co KSC from Al Khair National for Stocks & Real Estate Co, Kuwaiti British Readymix Co, and Gulf Holding Co KSC for $1.3 billion in cash, via an auction. Under the terms of the agreement, Oman Telecommunications Co paid $2.6 cash per share for every Mobile Telecommunications Co KSC shares sought. Following the acquisition, Oman Telecommunications Co increased its stake in Mobile Telecommunications Co KSC from 9.84% to 21.94%. The transaction was financed through a combination of long-term and bridge loan facilities. The acquisition is in line with Oman Telecommunications Co's strategy of growth and revenue mix diversification. Al Borg Medical Laboratories acquired a 93% majority stake in Proficiency Healthcare Diagnostics Laboratories LLC from Anglo Arabian Healthcare FZ LLC for $46.6 million. Proficiency Healthcare Diagnostics is located in United Arab Emirates and operates laboratories and radiology centers. The deal was originally expected to close within three months and was subject to certain customary conditions, including regulatory and third-party approvals. The Saudi British Bank acquired an additional 32.5% minority stake in SABB Takaful Co from HSBC Asia Holdings BV, Canada Water Nominees (UK) Ltd, Canada Square Nominees (UK) Ltd, and Canada Crescent Nominees (UK) Ltd, for $31.4 million in cash. Under the terms of the agreement, The Saudi British Bank is offering to pay $2.8 for each share being acquired in SABB Takaful Co. Upon completion, the acquisition would be reflected on SABB's FY17 financial statements, and it would hold 65% in SABB Takaful. SABB Takaful Co is located in Riyadh, Saudi Arabia and engages in cooperative insurance in compliance with the Islamic Sharia. The transaction was subject to regulatory approvals and the approval of SABB's board of directors, and was originally expected to close in the fourth quarter of 2017. A private group led by Evergreen Coast Capital Corp, a subsidiary of Elliott Management Corp, and Qatar Holding LLC, acquired Gigamon Inc for $1.5 billion in cash. Under the terms of the agreement, Evergreen Coast Capital Corp paid $38.5 in cash for every Gigamon Inc share sought. The purchase price represented a 21% premium to the unaffected closing price of Gigamon Inc dated April 28, 2017. Funding for the transaction came from the bidder's equity and debt financing provided by Jefferies Finance LLC. The transaction has been unanimously approved by the Board of Directors of Gigamon Inc.
Investcorp Bank BSC acquired Kee Safety International Ltd, a portfolio company of Dunedin LLP and Lloyds Development Capital (Holdings) Ltd, for $368.7 million. The acquisition would expand the market presence of Investcorp Bank BSC. Founded in 1934, Kee Safety Ltd is located in West Midlands, United Kingdom and employs 480 people. It manufactures and supplies tubular fittings and fall protection systems. The acquisition was originally expected to close by October 31, 2017. WCP Investments LP acquired Access Point Financial Inc for $350 million. WCP Investments LP is a joint venture between Wafra Capital Partners Inc and NBK Capital Ltd. The acquisition would enhance the financial service offering of Access Point Financial Inc. Founded by Trident V fund and the company's senior management team in July 2011, Access Point Financial Inc is located in Atlanta, Georgia, United States and provides lending and advisory services. Houda joined FactSet in 2010 and is based in Dubai.